This guy was once famous. Not just writer-famous, but Beyoncé or Beatles famous. In England, and to a large degree in America, he was the face of, and the center of, Victorian poetry. And poetry in Victorian times, the written-down and printed in books kind, was still a force in mass culture. Once an empire’s most famous poet, now reduced to modeling a Slanket. The town I grew up in was platted and settled around 1880, its success achieved by the industrious Swedish-American farmers around it and the railroad that went through it. The town was named Stratford, after Shakespeare’s birthplace, and so it was that the town’s main street, with it’s block of stores, was named Shakespeare Avenue. Shakespeare Avenue was met just north of the shops by the town’s central cross street, Tennyson Avenue. That’s a remarkable piece of trivia isn’t it? Think of how many suburbs and housing developments were similarly planned and platted in the centuries since in the United States. How many of them had main streets named for contemporary poets? Milton and Byron had their streets along with Shakespeare in Strafford, but even Byron was 50 years dead; but here was Tennyson, a man still in his career across half a continent and one ocean away, and here this proud avenue in a farming town was written down to bear his name. The problem with being a big-thing Victorian, as Tennyson was, is that our Modernists came after them. Came after them in time and eventually, opposition. Even though you can see the influences of the Victorians on the early work of some Modernists, you can also see the things they came to reject in search of an art for their own time. 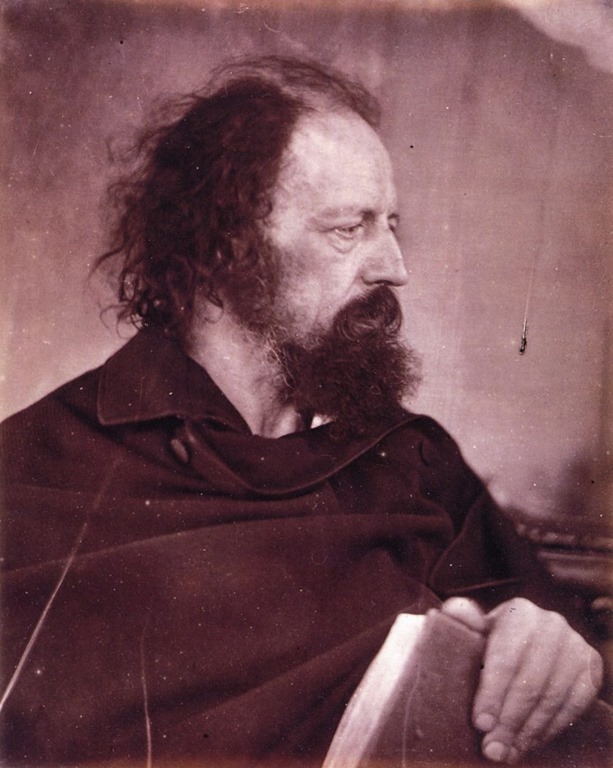 In those scattered small settlements where page poetry is still read or studied, we are now more likely to be reading Hopkins or Hardy for the English, or Dickinson or Whitman for Americans, or hinge figures like Yeats who spanned the eras, than Alfred Lord Tennyson, the once leading poet of his age. Besides the street in my tiny town, Tennyson lives on in a handful of phrases from his poems that have become commonplace mottos such as “It’s better to have loved and lost, than never to have loved at all”—words well-enough known even as their author’s fame and esteem has faded, that many people think they must be Shakespeare’s. Today’s words come from another section in the same long poem or collection that premiered the “loved and lost” phrase, Tennyson’s broad meditation on loss and perseverance “In Memoriam A.H.H.” If we’ve forgotten Tennyson, this makes it possible for him to be new again, and this is a piece, as I recast it, that seems very appropriate for our age—even for this year. The New Year’s bells ring in a new year, but they also chase away the devils of the old one. So, enjoy the music I wrote and recorded for “Ring Out Wild Bells”, but you may be surprised at how well Tennyson’s sentiments fit as you sing along with them while 2017 ends. The player for the audio piece is right below this. Reading another blog later on today, I found out that a reading of this poem,in Swedish translation as “Nyårsklockan,” is a tradition in Sweden on New Years Eve. Ahhh I want to live in that poet’s corner of a ‘hood! Lol’ed in the office (oops) over Tennyson’s slanket… it truly is age-old attire.